The Boeing F/A-18E & F/A-18F Super Hornet is a twin-engined one- or two-seat carrier-capable fighter and fighter bomber aircraft produced by the US-American manufacturer Boeing Defense, Space & Security (earlier McDonnellDouglas). 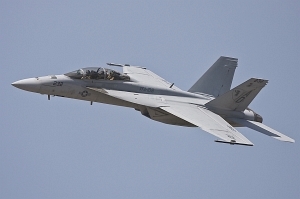 The F/A-18E is the single-seat variant, the F/A-18F is the two-seat variant. The F/A-18 Super Hornet is a enlarged development of the McDonnellDouglas / Boeing F/A-18 Hornet.